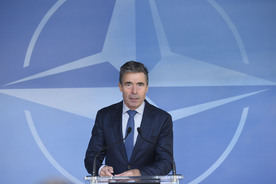 “The United States has briefed the North Atlantic Council on its determination that the Russian Federation is in violation of its obligations under the Intermediate-Range Nuclear Forces Treaty not to possess, produce, or flight-test a ground-launched cruise missile with a range capability of 500 to 5,500 kilometers, or to possess or produce launchers of such missiles,” the statement read. The U.S. on July 28 said Russia violated the decades-old treaty with cruise missile tests that date back to 2008. “The Treaty has a special place in history, as it required the verifiable elimination of an entire class of missiles possessed by the United States and the Soviet Union,” the statement said. CNN reported that President Obama has also written President Putin a letter on the matter. The New York Times first reported the suspected violation.